When there is severe weather a list of schools that are being affected in Leicester and Leicestershire will appear below. You can also hear details on BBC Radio Leicester. 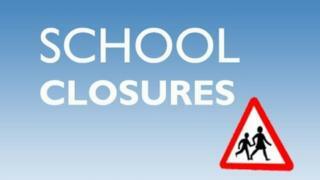 For information related to school closures in Rutland, please refer to the county council website. The BBC relies on schools and local education authorities to notify it of closures. We advise you to contact your child's school during periods of extreme weather to find out if it has been affected. The page will be manually updated between 06:30 and 21:00 GMT on severe weather days. Please note this page does not auto-update. If no schools are listed below then the BBC has not been made aware of any closures in the region.